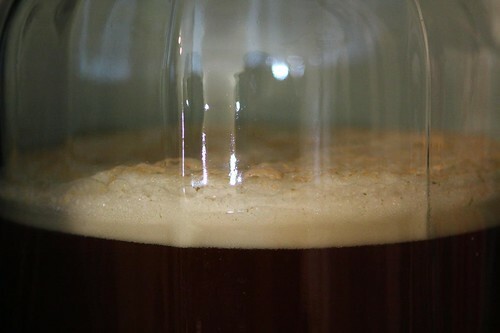 Months ago I brewed my first ever batch of beer. Then I bottled it. 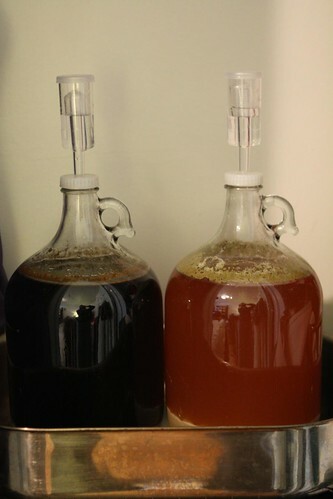 My first two, small, all grain batches are currently fermenting in the closet so I figured it was well past time that I get to talking about the results of my first batch. Since there are only a few bottles left I should probably get to recapping this experience. 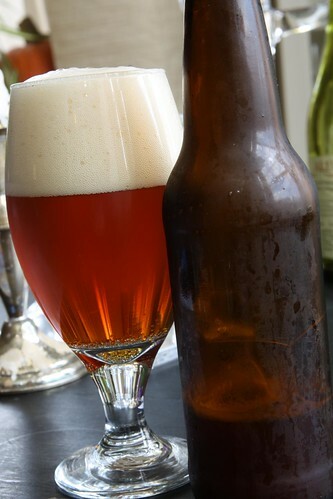 Most of my family and friends, whether they wanted it or not, were the recipients of at least a bottle or two of my first brew. The first bottles were consumed on Thanksgiving Day with my father-in-law who, despite its Belgian style, gave it a good review. A week or so ago I decided to actually taste it critically and take some notes. This particular pour looks a uncharacteristically clear toward the bottom of the glass given the time the bottle had to settle. You can see a little murky haziness seeping down from the bottom toward the end of the pour. It ended up having a large head about three fingers high which hung around for a while. There was a small amount of sediment in the glass but I've had more in previous bottles. This one must have just settled for a longer amount of time. In the flavor I caught a little over ripe peach or strawberry on this particular bottle. I don't recall this in previous bottles but I wasn't really paying as close attention before. I'm not sure if age could have brought this out. 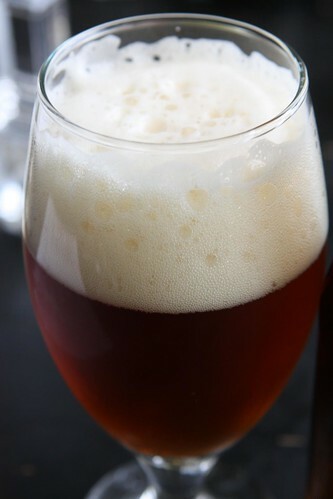 It was a light bodied, thin textured beer with lively carbonation and a slight chalky finish. There wasn't much sweetness or bitterness to speak of but a little bit of acidity to it. It measured in at 6.7% ABV and 20 IBUs. 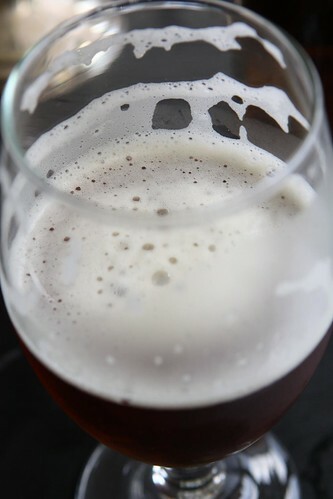 There's nothing that I intentionally did to cause it but the beer had excellent lacing. It's probably the best feature of this beer. There wasn't much of a hop aroma, not surprisingly. There was a slight malty biscuity taste with a little toffee. From the yeast I got a slight soapy smell. If I hadn't smelled this on so many other beers I would have been worried that I didn't allow the sanitizer to evaporate enough. No one has died (yet) from consuming this beer so either I did a passable job or the effects of its poison are very slow moving. While the beer was fermenting I decided to name it after a childhood memory of fighting kobolds in Dungeons & Dragons. 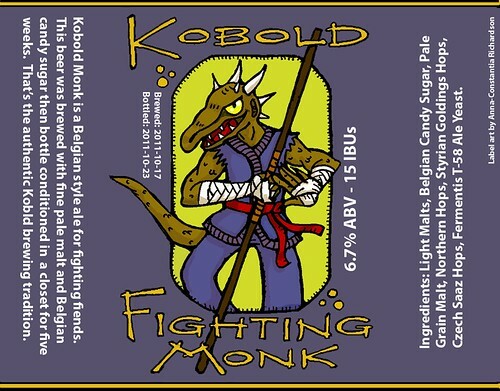 In honor of its attempted Belgian style I decided to name it Kobold Monk. It ended up turning out a little more like a French farmhouse style ale in my opinion but the name was already decided. Now I just needed to find someone to draw a kickass kobold for the label. I met a man in a back alley who gave me a tip that lead me to meeting Anna at Shoot The Sea, an artist who specializes in drawing kobolds. While I'd asked for a monk, I had not specified the pious, brewing sort of monk. She interpreted it as a warrior monk a la Shaolin. This was a happy accident and thus Kobold Fighting Monk was born. And now only a few bottles of this limited edition brew remain. Jen has twin buns in the oven and I have twin brews in the closet. It's like my version of a sympathetic pregnancy except it's easier for me to get on and off the couch. Unless, that is, I consume too much of my own creation. Please save one bottle for me if you can!! I haven't tried it yet and I am so excited about the lacing!! OK, I don't know what lacing is, but I bet it's great, and I really want to try this monk beer. Okay! I'll put a couple aside for you. On a related note: we need to hang out soon! Yes! I bet there is some way for us to combine hanging out with me getting to try the beer. If we try really hard! I don't really get how you're making that connection but I'll just trust you on this one.